Which Azure Solution Is Right for You? Need Advice on Transition Exams? Do you qualify for a FREE Transition Exam? Microsoft's new role-based certifications for Azure can help you skill up, prove your expertise to employers and peers, and get the recognition and opportunities you’ve earned, all while proving that you are keeping pace with today’s technical roles and requirements. Learning Tree is with you for every step of your certification journey. Our Microsoft Azure Certification Bundles are your end-to-end solution for preparing for and passing Microsoft’s new role-based exams associated with earning credentials to be a Certified Azure Administrator, Developer or Architect. ... and more, so you'll start off on the right foot for certification success! 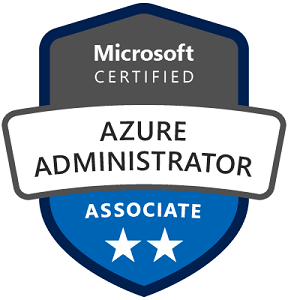 What is required to achieve one of these Azure Apps and Infrastructure certifications? Upon passing both exams, the individual will be Microsoft Certified: Azure Administrator Associate. 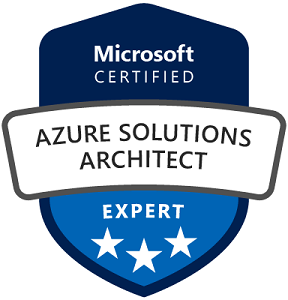 Upon passing both exams, the individual will be Microsoft Certified: Azure Solutions Architect Expert. Do these new exams and certifications replace any existing Azure exams? Will this change affect requirements for competencies? Yes. It will affect the Cloud Platform, Application Development, Application Integration, and Cloud Business Applications competencies. Cloud Platform: Exams 70-532, 70-533, and 70-535 are among the requirement options. Application Development: Exams 70-532 and 70-533 are among the requirement options. Application Integration: Exam 70-532 is among the requirement options. Cloud Business Applications: Exam 70-535 is among the requirement options. Exams 70-532, 70-533, and 70-535 will retire on December 31, 2018, but will be valid for competencies until December 31, 2019. The new requirements will go into effect on January 1, 2019. What should I do if I’m currently preparing for one of the retiring exams? Individuals who are currently preparing for Exam 70-532, 70-533, or 70-535 must complete the examination by December 31, 2018. Those exams will be valid for competencies until December 31, 2019. My competency is coming up for renewal and my organization previously met the competency requirements by taking one of the retiring exams. Do I have to take the two new certification exams to meet requirements? Exam AZ-102: Microsoft Azure Administrator Certification Transition Exam is for those who’ve previously passed Exam 70-533. Exam AZ-302: Microsoft Azure Solutions Architect Certification Transition Exam is for those who’ve previously passed Exam 70-535. What is the difference between the new role-based certification exams and the transition exams? The content domains assessed in the new role-based certifications are based on a thorough JTA that was done to truly understand the skills required to be successful in that job role. After compiling that list of skills, we narrowed it down to what we would measure in the certification process. If you haven’t passed the associated existing exam, to become Microsoft Certified, you will need to pass the exam(s) in the path. However, if you have passed the associated existing exam, we want to recognize your accomplishments and provide a shorter path to certification through the transition process. The transition exam is intended for people who have already demonstrated skills in the content domain by passing the existing exams that the new role-based certification exams will be replacing. They cover the delta between the current certification and what we expect people who earn the new certification to be able to do. We don’t want to retest people on the same content where they have already demonstrated competence by passing the existing exam, and we don’t want to penalize people who have been preparing to take an exam that we are replacing with the new certifications (they should still take the exam, but they should do so quickly, as all of the affected exams will be retired within six (6) months of the new exam availability). Transition exams cover net new content, content that wasn’t covered in enough depth, and content on aspects of the technology that have likely changed since someone took the exam. As a result, the transition exam is not shorter than a typical exam but more focused on the key tasks and skills that were not assessed in the existing exam or certification that is being replaced. Will there be an on-demand version available? Yes, this content is available outside the classroom.